Black pepper is fruit of the pepper plant. Black pepper is used for seasoning or spices to add flavor to a meal. Black pepper is made from the berries of a pepper plant which have been picked when almost ripe. Largest producer is the southern Indian state of Kerala. Buy(order) Kali mirch-Black pepper online at whole sale price from KiranaPlace, a online spice and seasoning shop. Black pepper (Piper nigrum, Kali mirch) is a flowering vine in the family Piperaceae, cultivated for its fruit, which is usually dried and used as a spice and seasoning. When dried, the fruit is known as a peppercorn. 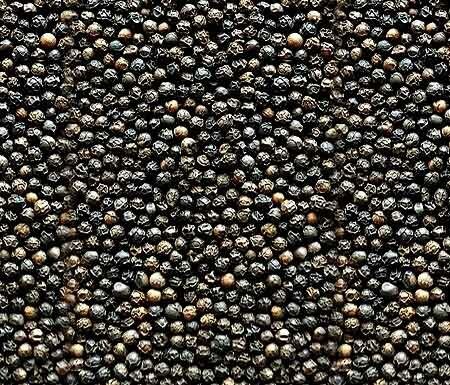 Black pepper is the world's most traded spice. Black pepper is ubiquitous in the modern world as a seasoning and is often paired with salt. Pepper spirit and oil can be extracted from the berries by crushing them. Pepper spirit is used in many medicinal and beauty products. Pepper oil is also used as an ayurvedic massage oil and used in certain beauty and herbal treatments. Black pepper contains iron, potassium, calcium, magnesium, manganese, zinc, chromium, vitamins K,A and C, with trace amounts of other essential nutrients, protein and dietary fibre. Black pepper has an active component called piperine that gives black pepper its characteristic taste. Black pepper contains between 4.6% and 9.7% piperine by mass, and white pepper slightly more than that. Black pepper eases digestion and stimulates the stomach. Black pepper is antibacterial in nature, and therefore helps to cure cold and cough. Black pepper helps to break down fat cells, and also increases metabolism. Black pepper helps to deal with depression. Black pepper relieves stomach gas and also helps prevent gas formation. Black pepper can be used to clear up a stuffy nose and congestion as it helps loosen phlegm. Black pepper can be used to cure Vitiligo, skin problem.